In the middle of the chaos and people dying, a small black could is seen in the distant sky. No, it is not an asteroid about to collide (hit) with the earth. The "cloud" is Jesus coming back as King. As the cloud gets nearer, it becomes brighter and brighter. Many of the wicked call for the rocks and the mountains to fall on them – they do not want to face their Creator. [2 Thessalonians 2:8] The cloud is brighter than the sun. The Bible says the wicked who are still alive are killed by the brightness of Jesus coming. Then something beautiful and wonderful happens. In 1 Thessalonians 4:13-18, Paul tells us that the good who have died are all sleeping in the graves. 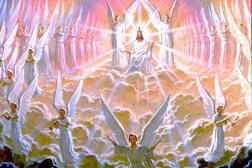 But, at Jesus coming they are all raised out of their sleep of death. All around the earth, graves are opened. God’s people from all the ages are raised to life. Angels bring babies to their mothers. Husbands find their wives. Children hug their parents. The Bible says that these people start to go up to meet Jesus in the clouds. Paul makes it clear that the good people who are alive are not left behind. They also rise to meet Jesus in the air. 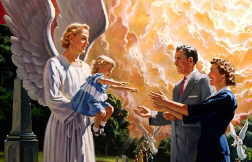 [1 Corinthians 15:51-54] This "meeting Jesus in the clouds (sky)" is a test one can use to tell the difference between Jesus true coming, and Satan’s false coming. Satan will appear to people on the earth. Satan claims that he is Jesus. 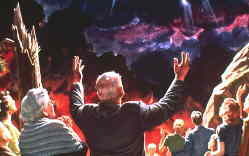 But, when Jesus returns the second time, Jesus does not touch the earth. We all go up to meet Jesus "in the air"! Go to the Next Section: When God Explains Everything to find out what happens next.